Throughout National Catholic Sisters Week, Catholic Volunteer Network will share interviews with volunteers currently serving alongside sisters. In each post you will hear a little more about how the volunteers found their program and what they’ve learned from the sisters they work with. 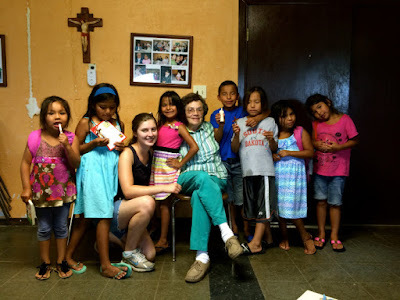 Today we feature Molly Trainor from Pataskala, Ohio, a graduate from Franciscan University of Steubenville, volunteering with the Benedictine Volunteers. 1. How did you find your volunteer program? What appealed to you about it? Benedictine, Molly Trainor works hand-in-hand with Sister Aurelia Palm, OSB, master gardener of Mother of God Monastery in Watertown, South Dakota. 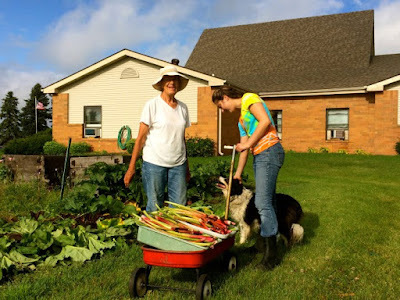 Molly and Sister Aurelia harvest rhubarb together with the monastery companion, Abbey. 2. What does an average day look like for you? In my average day, I wake up early because I like the time to prepare for the day before morning prayer at eight. After morning prayer, I might help Sister Aurelia in the monastery gardens or assist the director of Habitat for Humanity Greater Watertown Region. After, it’s time for Mass in the chapel, catching up with the Sisters over lunch, and then a short midday prayer. Depending on my schedule, I then head to the Benedictine Multicultural Center to help with English as a Second Language classes or to Benet Place Independent and Assisted Senior Living where I visit with residents. 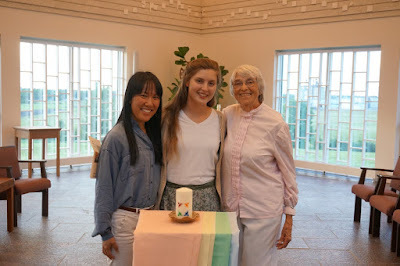 Afterward, I return to the monastery for my favorite part of the day: evening prayer and supper with the Sisters, followed by community recreation. 3. How has service strengthened your faith and your understanding of vocation? By showing me the value of serving my brothers and sisters in Christ, service reinforced for me that we are all in solidarity in the Universal Church. Service allowed me to step out of myself and my own desires, drawing me closer to the Lord. It also strengthened my understanding of vocation by showing me that my call is largely where my skills, my interests, and the needs of the world intersect. Service helped me see that, while I have to be open to all the paths God may choose for me, whatever the path, it will be one to which I am uniquely suited. Benedictine volunteer, Molly Trainor helps Sister Charles Palm, OSB with a Native American Children’s Summer Camp in Fort Thompson, South Dakota. 4. What have you learned from living and working with the sisters? Living and working with the Sisters gave me the chance to experience a life ordered toward God. Through my time of service, I learned from the Sisters the joys of living a life focused on God and His will. Their courage and dedication in following their vocations taught me to place my trust in God and know that whatever my calling, God will provide. 5. What advice would you give to someone interested in full-time volunteer service? and grow from the experience. To learn more about CVN’s From Service to Sisterhood initiative and discernment resources for volunteers, please click here.